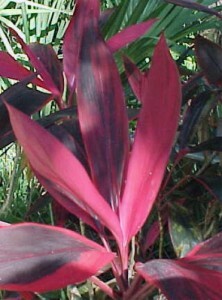 Description: Cordyline terminalis is an evergreen tropical shrub that can reach up to 3 meters tall, though generally seen about 1-1.5 m high in cultivated plants. Leaves can be 30-60 cm long and 10-15 cm wide, shaped oblong-lanceolate, elliptic-lanceolate or narrowly oblong with 10-30 cm petioles. Cordyline terminalis is attractive and colourful ornamental foliage plant, that is great in containers for indoors, houseplants or located at the porch, deck, patio and outdoors. Cordyline terminalis are such magnificent plants, ideal for landscaping, and definitely a shrub that add interest and marvelous contrast, making an impact wherever they’re planted. It can be used with success in tropical cut flower arrangements.